The Data Modeling Diagram is used to create or view graphical models of relational database system schemas including a range of database objects. The diagrams can be drawn at a logical or a physical level. When a physical schema is being represented the modeler can choose the correct RDBMS which will enable the appropriate data types. Tables, Views, Stored Procedures and other objects are connected showing the way they are related to each other. Tables are the central element of the schema and can show the contained columns including datatypes, indexes and keys. 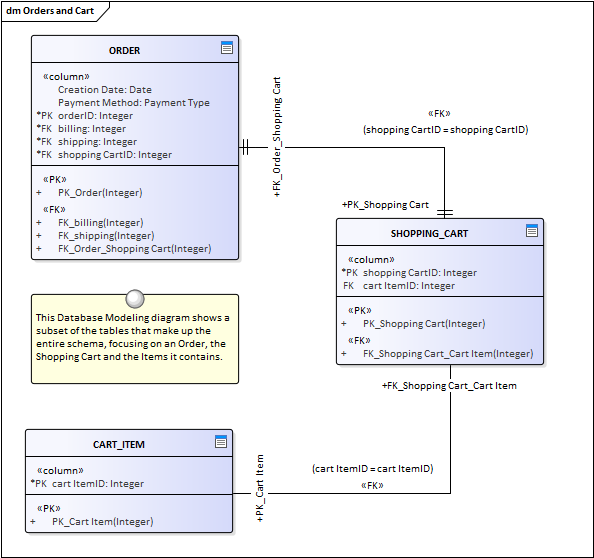 The Data Modeling Diagram can be used to create database schemas or to view schemas that have been reverse engineered from a live database connection or transformed from a more primitive model. It is a useful diagram to visualize the connections between a variety of database objects. They can also be used to show traces back to other elements such as Requirements, logical Components, and Business Rules. Primary, Foreign and Unique keys can also be modeled and displayed on the diagram. The notations can be interchanged by changing the 'Connector Notation' property.